Surely I'm not the only one that does this. 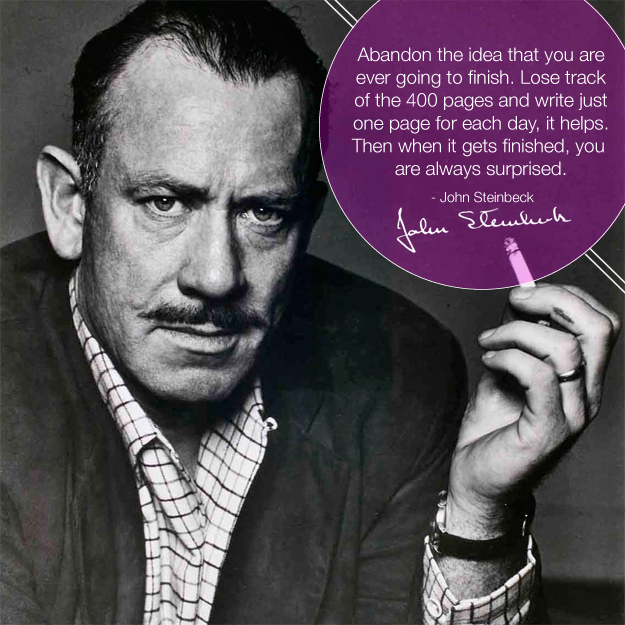 No, not what Steinbeck recommends. I tend to do the opposite. I focus very intently on my goal (Must write 1,000 words per day. Must run 30+ minutes every other day.). So intently that often, instead of just writing something (even if it's only 250 words), I write nothing. Maybe I'm busy that day or I'm feeling unimaginative or I give in to distractions. My goal intimidates me so much that instead of just trying (even if I don't make it to the word count), I abandon the activity and move on to something else. I toss away the day, labeling it fruitless before I've even sat down or written just one word. The basic goal should always be just to write something every day. Too often I forget that. As long as you're striving toward your goal, you haven't failed. Agreed! If I focus too much on a word-count goal, I get discouraged before I even start and procrastinate the night away. Getting something down, even just a paragraph you like, is far more productive.